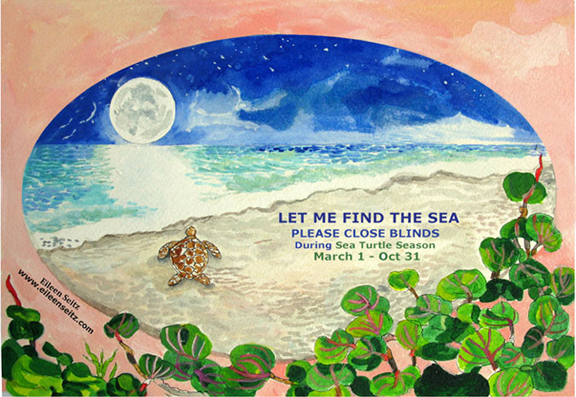 Sea Turtle Oversight Protection www.SeaTurtleOP.org, commissioned Eileen Seitz to paint this magnificent night scene of a turtle returning to sea. 6″ x 9″ Postcards were printed and placed into the hotel bedrooms along Broward County’s Beaches to guide and ask the guests to close the blinds at night before they leave the room. STOP is a sea turtle conservation organization that is dedicated to the scientific and educational aspects of the human impacts to sea turtles on Broward County’s beaches, nationally and internationally. disorientation due to artificial illumination of the nesting habitat. endangered and threatened sea turtle hatchlings. This data is compiled, organized, updated and available to the public via our website. of Florida to date operated by a private nonprofit.